When setting out to build a low impact off-the-grid home it pays to do a little research before hand. Alternate energy systems are imperative and should be considered thoughtfully. A combination of systems working together is the best method, much like the principles of perma-culture gardens where each component aids the other. First and foremost the owner/builder must have a workable plan that meets all government and personal requirements. This plan must take into account things like proper ventilation, adequate insulation, structural integrity and protection from the elements. 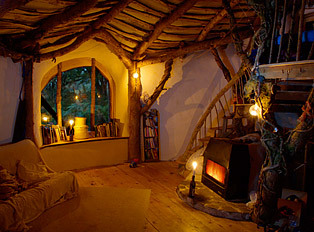 The dwelling must provide warmth, comfort and safety for its occupants. In the plan, water heating, refrigeration, food storage, a stove, a bath and a toilet must be factored into the design, as well as which energy sources will power the living system. These may vary from wind turbines, solar, fuel or battery and may incorporate any or all combinations of these. You may also want to consider installing skylights for natural lighting , a wood-burning stove with a flue that runs through the building to circulate heat. or left as is to dry in a pile sheltered from the rain. 6 to 12 months is sufficient depending on the climate. Bark makes for a good insulator, provides protection from the elements and is aesthetically pleasing. When choosing your logs the more numerous and tightly packed the rings, the older and better the product. Avoid any that are split. The basic construction is a series of vertical posts in an oval, the tops of which are connected with horizontals. These horizontal pieces make what is conventionally referred to as a roof-plate or wall-plate and are ‘tennoned’ into the posts. Post holes are dug at least 3 feet deep into the earth depending on their length. Structural posts are placed in these and a mixture of sand and cement poured. It is important but not imperative to keep the posts level as this ensures a maximum load bearing integrity. 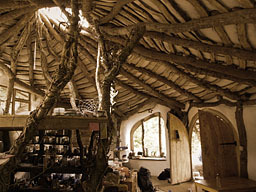 Reciprocal roof rafters fashioned from fallen branches form the framework of the ceiling. 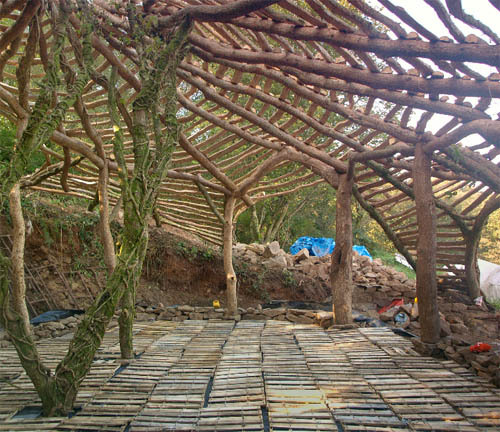 Brace these with thinner, supporting branches overlapping the edges of these to form a roof. Start with the thicker branches and thin them out as you near the top. Bolt these together and continue until sound. Water-proof the roof by covering it with a plastic tarp. Lash or staple this down to the timber frame with a nail-gun. To make a reciprocal roof, the first rafter is propped up temporarily, the next rafter is then laid so that it sits on top of the first one. The third is then laid so it sits on the 2nd where the 1st & 2nd cross. 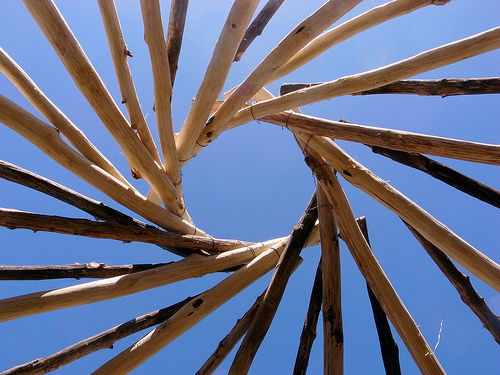 Each rafter sits on another below and has one sitting on top of it. This process continues all the way around until the last rafter slips underneath the first. The prop is then removed so the first rafter sits on the last one. The rafters are then fixed where they cross. 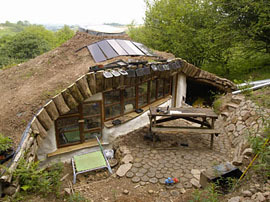 Straw bale walls have excellent load bearing capacity and are quite suitable for two story houses. Straw-bales in the floor, walls and roof provide superior insulation. The bales are stacked like giant bricks and secured to each other with wooden stakes. These stakes can be hammered through the bales or tied in pairs on either sides of the wall. Palettes on the floor beneath the bales will keep them free from damp. Reclaimed palette timber lain on top of these bales can be sanded back, oiled and used for floor boards. 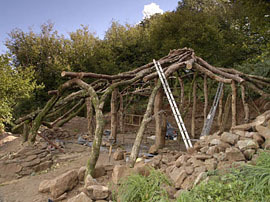 Build the walls with straw-bales inside, The bales are stacked on rough dry stone wall and staked together with raw branches. The inner walls can then be rendered with lime plaster which is breathable and less labor intensive than cement walls. Lime render is more durable and excellent for exterior use in wet climates, it is strong and sets quickly without cracking. Pop windows in spaces between the straw-bales that make up the wall. Bog up any gaps that remain with straw then chainsaw trim the bales smooth with round corners. On the out-side surrounding mud and or dirt and turf is used to cover the roof diminishing again its visual impact upon the environment. 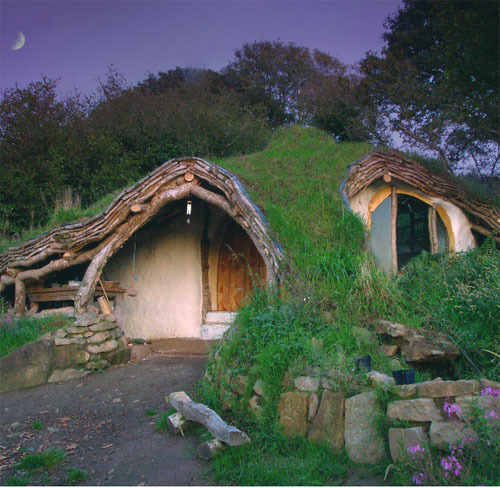 Some other features include a gravity fed water system that is drawn from a nearby spring, with roof water collected for a garden pond; A composting toilet and a fridge that is cooled by air coming up underground through the foundations. The Flue goes through a stone and plaster mound to retain and slowly release heat. 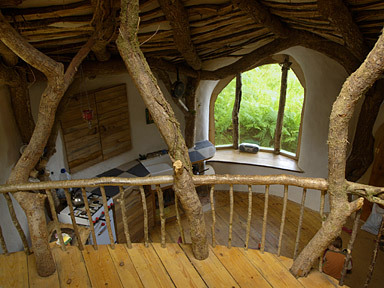 The information in this article was based on ‘A Low Impact Woodland Home’ from http://www.simondale.net/house. Very special thanks to the contributors.